I finally got a good night's sleep, so I woke up at 9:00 a.m. refreshed and ready for adventure. The original plan was to take the Stehekin Bus to Rainbow Falls, and then walk back (about 3 miles one way). But we got a little behind schedule and missed the bus, which only runs every few hours. Instead, we decided to bike. 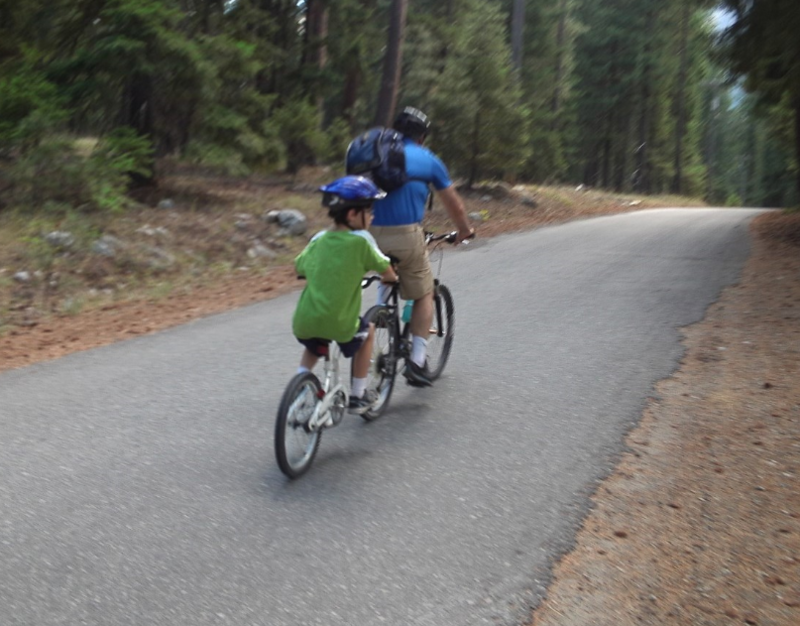 Ordinarily, biking would be a no-brainer, but Drew is actually still learning to ride. The night before, we'd tried out a "co-pilot" tandem, where a smaller bike with a back wheel is attached to a full size bike; but it felt incredibly unstable.The other option was one of those bike trailers. The guy at Discovery Bikes said the tandem would be much better, and explained how once the back rider starts pedaling it stabilizes. So Drew and I gave it a test ride, and it worked! 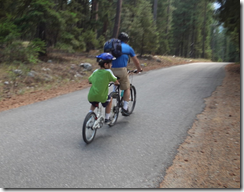 Soon we were pedaling toward our first destination, the Stehekin Pastry Company bakery. While the bike felt stable, every once in a while Drew would lean over too far, and I'd need to compensate. This was unnerving when the road narrowed or cars passed by. As Brenda rode behind us, she told Drew "not to lean." Well, he didn't like that too much and said he wanted to go back. Fortunately, we arrived at the bakery. 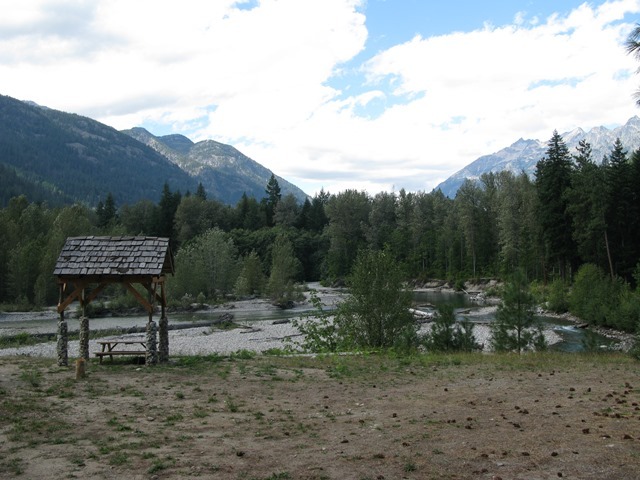 The Stehekin Pastry Company is the perfect pit stop for bikers, hikers, and kids who want to turn around. 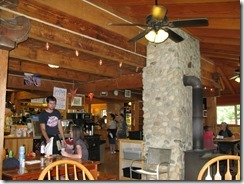 Serving an assortment of pastries, sandwiches, ice cream, and drinks, it's located about 2 miles from the Stehekin Landing. 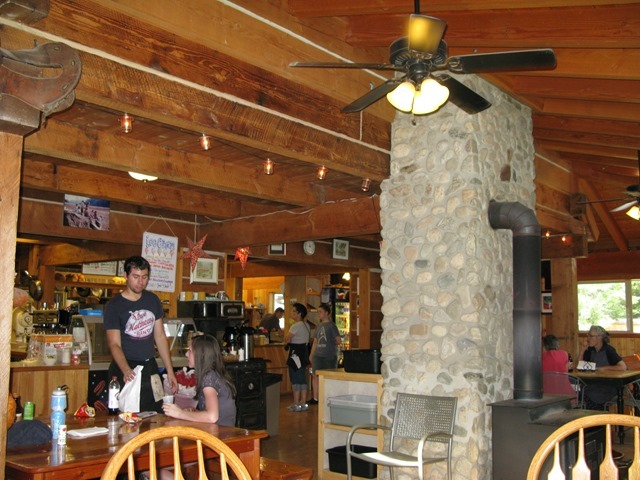 The alpine ambience and friendly staff make you feel at home -- like eating at your favorite neighborhood restaurant. We ended up getting cookies, a lemon bar, and a blackberry scone (all of them delicious). Most importantly, it was enough to get Drew back on the bike. 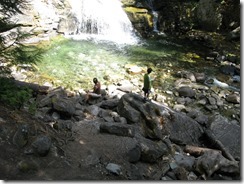 The trek to Rainbow Falls was difficult in places because of a few steep hills. When it got a little too tough, I jumped off the bike and walked . 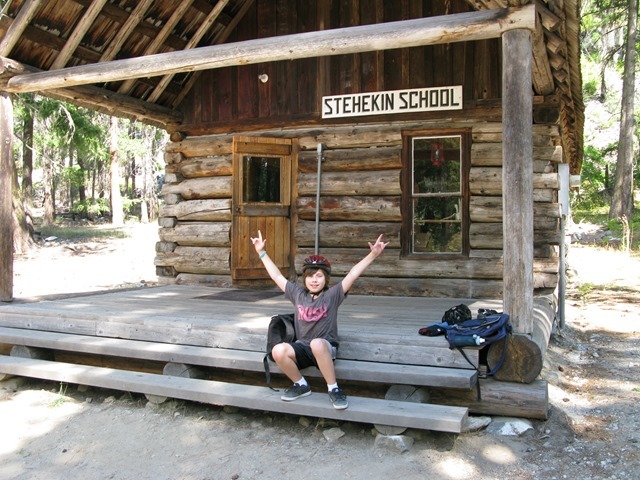 Along the way, we stopped at the Old Stehekin School. 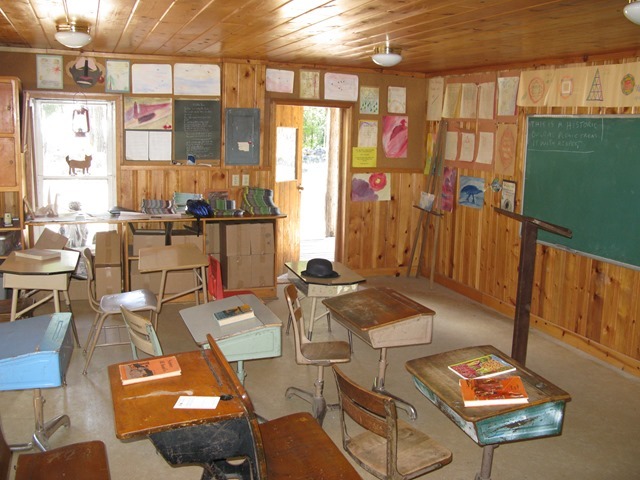 This is a one-room school -- like what I remember seeing on the show Little House on the Prairie. 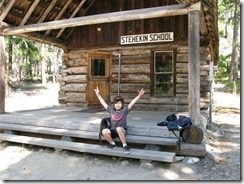 According to the Stehekin Heritage Guidebook, the school was built in 1921 and was used for 67 years. 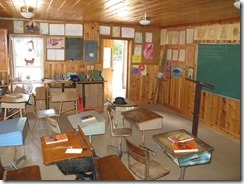 A new school was built for the 1988-89 school year for students in Kindergarten through 8th grade (students have to move elsewhere to go to High School). I liked how the room featured artwork and posters from students about the history of the school and Stehekin area. A message on the chalkboard read, "This is a historic building. Please treat it with respect." After getting buzzed by (surprise!) bees and a few mosquitoes, we biked the steepest part of our journey to Rainbow Falls. When we got there, a red Stehekin Bus was parked in the turnaround (probably the bus we would have taken had we not biked). 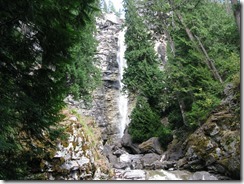 Rainbow Falls is a towering 312-foot waterfall that drops onto a few different rocky terraces. 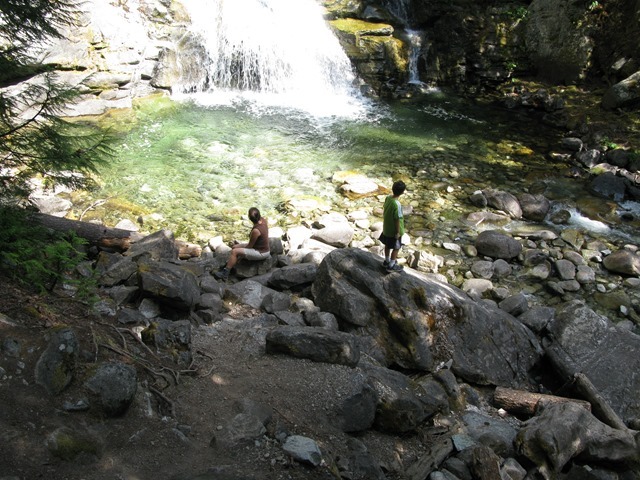 The last section creates a beautiful fan of water spilling into an inviting alpine pool. Since the park ranger-led tour had left, we had the place pretty much to ourselves (and the hundreds of mosquitoes trying to attack us). Once we left Rainbow Falls, we coasted down those same hills that had taken so much effort to climb. I often forget how exhilarating it is to fly down a steep hill on a bike, which Drew was experiencing for the first time. (It also makes me realize why people love motorcycles.) I actually slowed us down a little, since I knew Drew wasn't used to this kind of speed on a bike. As we sped along, I started noticing amazing views that I'd missed on the way up -- when my vision had been narrowed by concentration and fatigue. One view was so spectacular, I had to stop to take a picture (which meant Drew had to stop, too). As I stood there, I heard the screech of a hawk echo above. 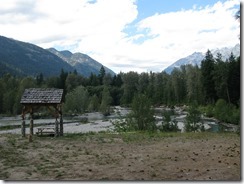 Then, for the second time that day, we stopped at the Stehekin Pastry Company. This time, I ordered one of their sandwiches on homemade bread (again, excellent). And then we were off again. As we biked along Lake Chelan, the views in the mid-afternoon light were stunning, with towering mountain peaks, streaming sunlight, and deep blue water. I was starting to realize how Stehekin was joining my short list of magical places that include Cannon Beach, Oregon; Whistler, B.C. ; Tofino, B.C; Monterey, California; and all of Hawaii. Whenever I'm visiting these magical places, I think of what it would be like to live there. Then I realize that visiting is part of the magic -- that it takes on an idealized state in memory. You don't get to see the effort that goes into living in a place like Stehekin, which is dependent on boats and planes for many supplies. Maybe that's part of the appeal? I was already thinking about when we could return.